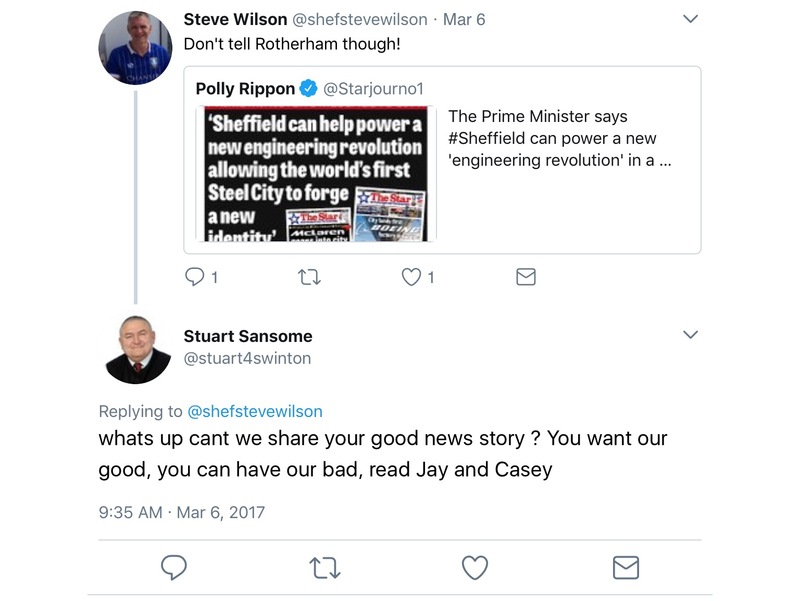 Councillor Stuart Sansome thinks making light of the Jay and Casey reports in a pithy comment on Twitter is an acceptable thing to do. Curiously, the reponse is directed at something completely unrelated. Why? This entry was posted in Information and tagged Casey Report, Jay Report, Stuart Sansome by Rik. Bookmark the permalink. Sansome seems to want to airbrush the cse grooming from their crammed dustbin of history. Was it the price for this ignorant thug to be allowed a cllr. Time they were held to account for staying stum for years whilst victims were being abused. Families in our area were never warned of the risks for years. I suppose it’s to much to hope Cllr.Samsome will be censured and/or disciplined by the Labour clique that controls Rotherham? The same people are very quick to direct their rage at Tories who post inappropriate comments on social media. Surprise surprise, time he hung up his boots now! This Oaf is not fit to be in any sort of public office – he uses the Jay and Casey reports, both of which damned him and his ilk for the incompetent and PC crazed fools they are ? He should be hung out to dry for this crass tweet ! Get him out and bring on the election thats what I say! On a more serious note, I do think certain people need to ask themselves whether he has the capacity to carry out the role of a reasoned advocate for people in his council ward. Im not sure he can. Yep. Bring on the gen election. He was a flunky who liked his tummy tickled by the gaffers. He can take his useless chum atkins too. worst union rep going, did what he was told and never took owt seriously. doesnt surprise me, Ive seen him time and time again do stuff like this. I hope he gets pulled and made to publicly apologise. I stand by to publish any apology that Sansome makes but I won’t be holding my breath! Who voted for Sansome to be the union rep and, if he was as useless as other posters have also commented why was he not voted out? If he got violently gang raped would he see a funny side to that? I would doubt it very much. Its just overblown oafishness, the sort you would expect from a town councillor. If I were the powers that be inside Rotherham Labour disciplinary committee, I would just sack him, wheel out another twerp from the unions and ban all of them from making political statements through social media. Load of hypocrisy. Many of the Cllrs knew what was happening about CSE, including the scale of it, but did nothing. And you lot have done nothing either to call them to account. All you do is vote them in again and again and again.